Debra created an adorable no-sew banner for her grandaughter's first birthday using felt pennants, giant rick-rack and Joy embroidered letters. After the party's over, how cute would this banner look hanging in baby's bedroom? Upcycle your jeans into a no-sew 4th of July party banner! Fabric pennant banners are great holiday party decorations that you can use year after year - and they're quick and easy to make by upcycling an old pair of jeans! The combination of red burlap with white Joy iron-on letters and blue denim makes a perfect banner for a 4th of July picnic or BBQ. 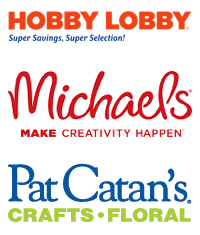 I chose the word "liberty" - you can personalize your Independence Day banner with your favorite patriotic message. 1. After trimming away the seams of your old jeans, cut open the legs and trim out enough triangles from the denim as needed for your word - one for each letter. Cut smaller triangles from red burlap. You can create a triangle template first from a folded sheet of paper if needed. 2. Iron-on a letter to each burlap pennant, then glue each burlap pennant to a denim pennant. 3. Paint the clothespins white - clip them to the edge of a cardboard box first to make painting them easier. You can also dry-brush a little white paint to the edges of the pennants if you like a more distressed look. 4. Attach the pennants to a length of twine with the clothespins and hang - let the party begin! I really love the soft texture of embroidered letters - they look so much nicer than chipboard letters on a handmade greeting card. 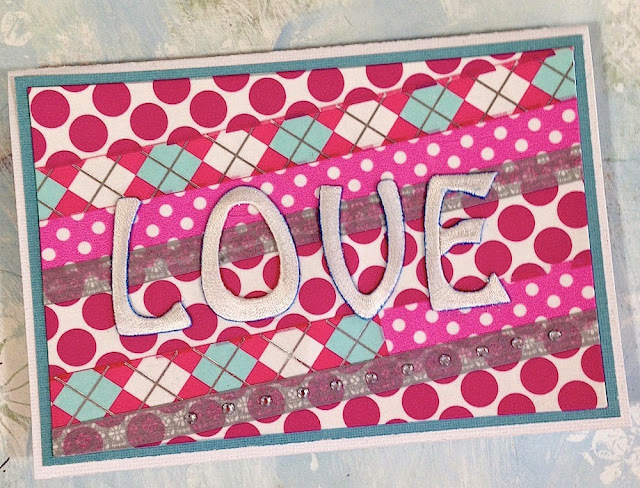 Click here to see how I used washi tape as a background for this cheerful all-occasion card. Summer is the time for outdoor picnics and BBQs with family and friends. Make it more fun with a personalized apron for your favorite grill-master! With a little imagination, you can turn a plain apron into a bold statement in just a few minutes with Joy iron-on embroidered letters. 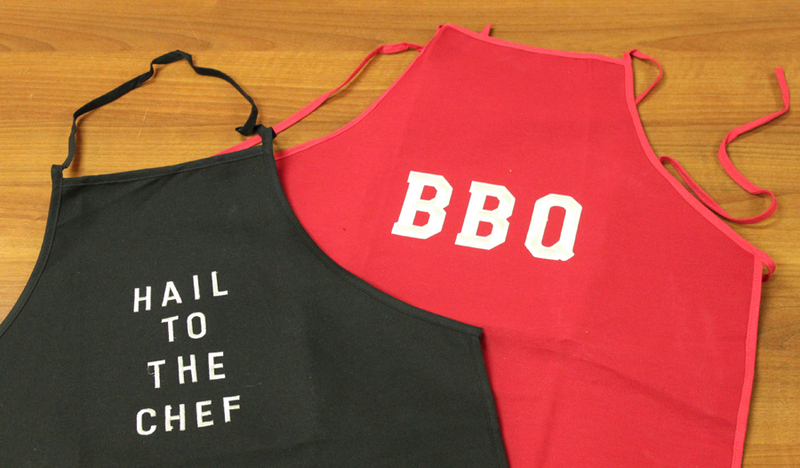 A personalized BBQ apron makes a great gift for anyone - men, women and kids, too. Embroidered letters were the perfect accent for Anita's birthday photo album cover - click here to see how she colored them. This shirt helps your child learn their ABCs and how to say "hi" to their friends and neighbors. 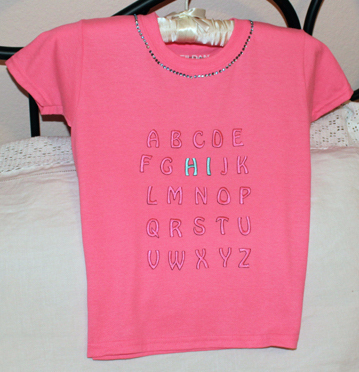 Click here to see how Julie made this adorable tee-shirt with Joy iron-on embroidered letters! 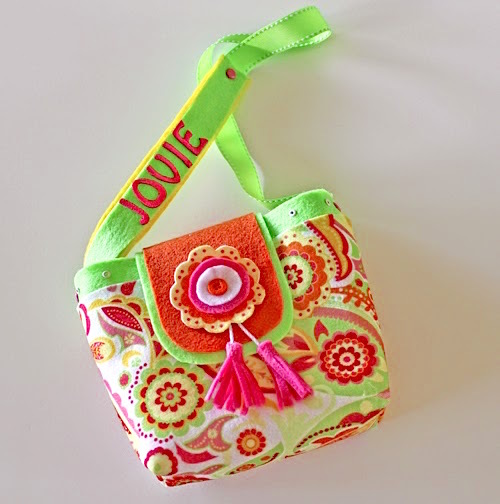 Julie McGuffee made this colorful no-sew purse for her granddaughter with felt, then added her name to the strap. It's both adorable and practical for a little girl who might forget where she left her purse. It's so easy to create an initial pendant with JOY iron-on letters. Personalize your pendant with your favorite fabric, beads and bezel. 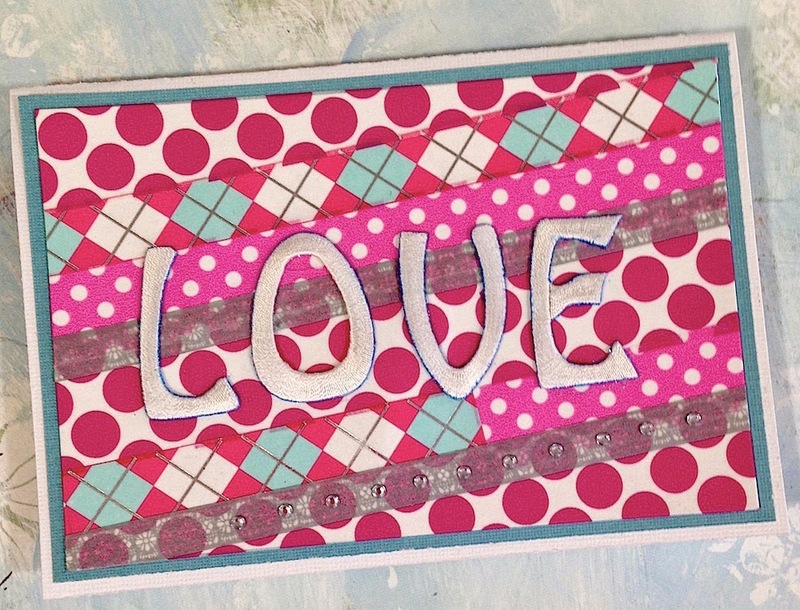 You can even change the color of your letter with permanent ink or fabric dye. Click here to visit my blog for details. Are you looking for ways to personalize a gift for the little girl in your life? I took this sweet baby onesie and a tulle skirt and did just that! For details, visit my blog. How sweet is Sam the Wonder Lab? 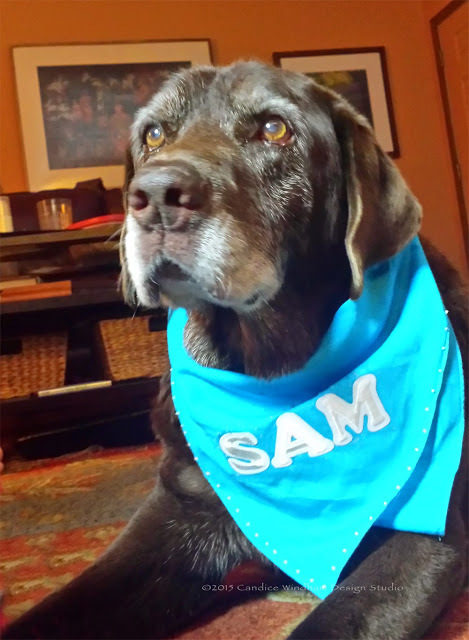 Make any dog feel more special with a fabric bandana in your favorite color, personalized with their name. Learn more on Candice Windham's blog. 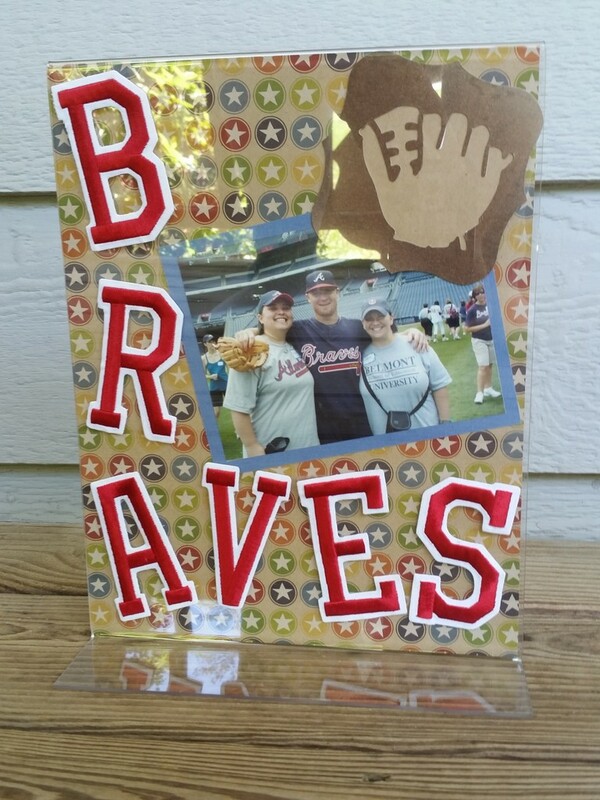 This is a great personalized gift idea for the sports fan or athlete in your life. Click here to see how Lorrie McCullers used Joy letters to turn a ready-made plastic sign holder into a cherished memento to celebrate her favorite baseball team. Go Braves! 'Tis the season for celebrating the grads in your family! Marilyn glammed up a ready-made sign holder with glitter and bling in school colors and then personalized it with Joy letters and numbers. 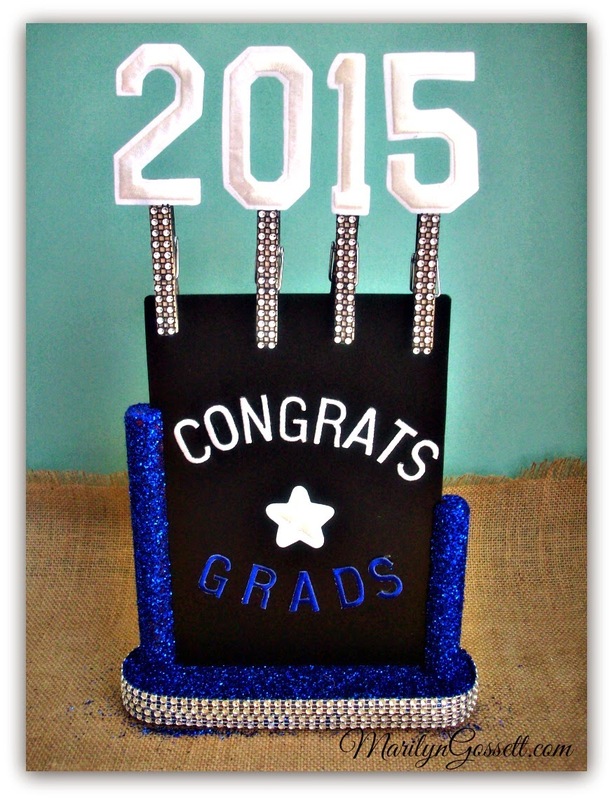 Click here to learn how she made this special graduation party sign. Okay, so maybe he's not exactly a chef, but he's your most favorite "cooker guy," right? 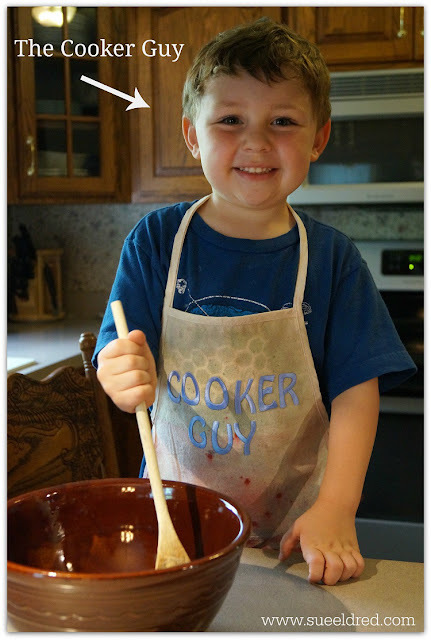 Check out how Sue Eldred painted a kid's canvas fabric apron and then personalized it with her grandson's adorable phrasing, using Joy iron-on letters. He loves to help Grandma in the kitchen!